Infilled Puncture Proof Wheelchair, Scooter Tyre. 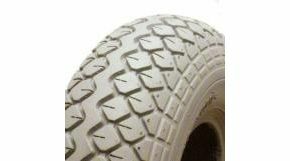 The infill system offers the ultimate in tyre puncture proofing for wheelchair and mobility scooter tyres, with long tyre wear and excellent ride quality. The inner tube is replaced with a rubber compound which offers virtually the same ride characteristics as a fully inflated pneumatic tyre. The need to constantly check tyre pressures is eliminated, and as the tyre is always at the correct pressure optimum tyre wear is guaranteed. Suitable for two piece tyre rims only. There is no need to return rims to factory as tyres and rims can be fitted on site. brilliant service they rang to make sure that everything was correct recommend this company.